One of the key elements in an IT Project SDLC is the build or construction phase. How do you plan & estimate the duration of this phase and equally important how do you monitor that it is still on track when you have baselined your plan? 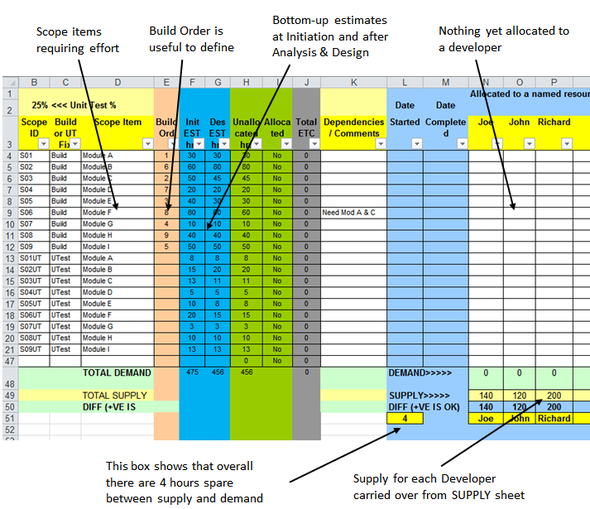 Although there are various ways you could tackle this, my proposition is that the spreadsheet based Build sheet I have designed has various key benefits over other approaches as explained in this post. 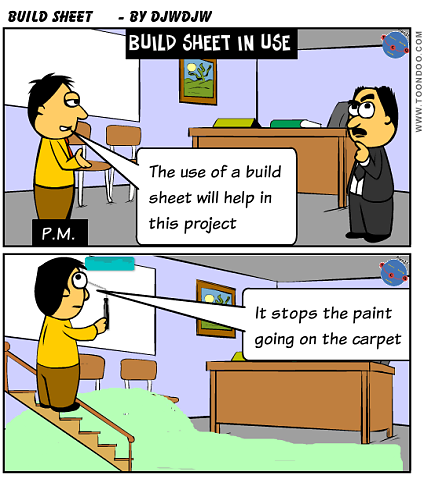 When putting together your IT Project plan, you need to estimate your Build phase (typically including Unit Testing). The classic approach to doing this is bottom up estimating using expert judgement (also have a read of my post on Estimating in general). So decompose the business requirements into required system changes, decompose further if it aids estimating and then have your experienced developers / designers estimate the effort required considering local quantity processes. Clearly the objective(s) could be achieved through a scheduling tool such as Microsoft Project or Open Workbench especially if actuals and estimates to complete (ETC) can be automatically fed into the plan (e.g. Microsoft Project Server or Niku). However, such an approach requires the tools in place, the time and skills to use the tools and in terms of the integrated systems, a certain level of organisational sophistication which is fairly rare in my experience. In terms of units, I tend to use hours but other units could be used. 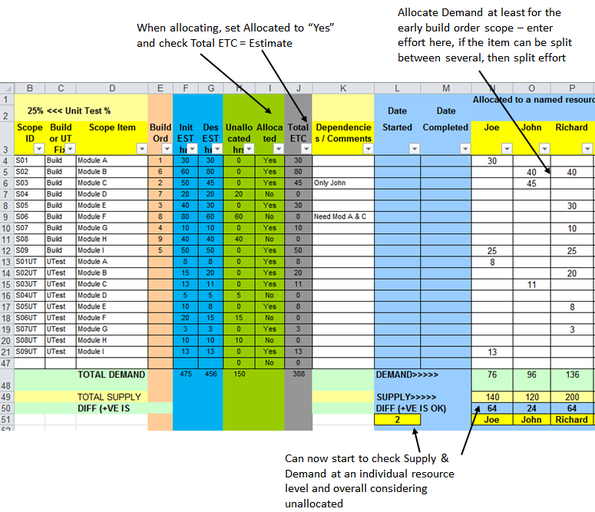 Some simple spreadsheet calculations allow the Supply per resource and in total to be calculated. Although you can plan and monitor a SDLC Build Phase with traditional scheduling tools, I believe that a spreadsheet based Build sheet balancing Demand (things to be done) with Supply (resources available to do the things) offers a number of key benefits. If I have intrigued you sufficiently, please take a look at the worked example which will make things clearer. 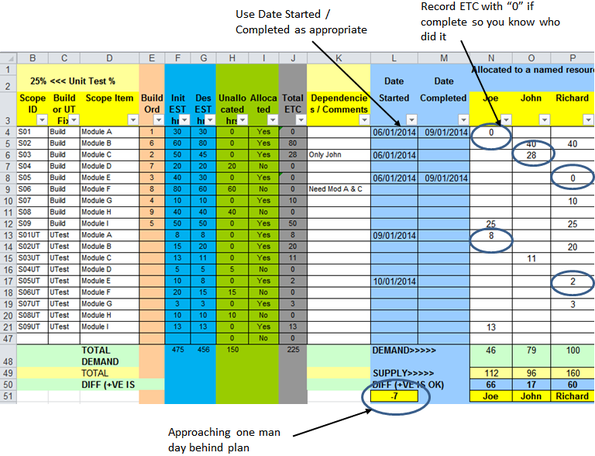 In a previous Post I have suggested a Build spreadsheet approach for planning and monitoring an IT SDLC build phase. 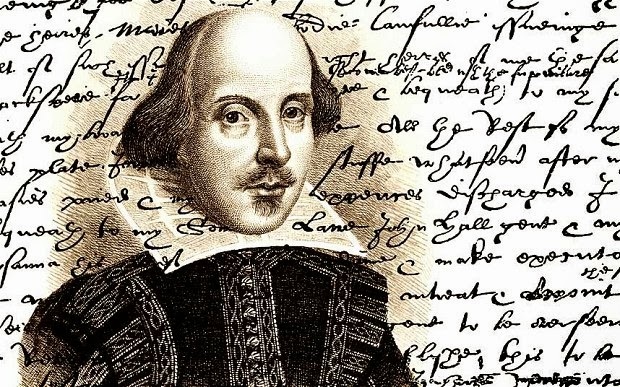 In this post I take you through a Worked example to make things clearer. The example assumes a build phase from 06/01/2014 to 07/02/2014 although as you will see this is easily adjusted. The worksheet (columns P onwards) has the days of the week and the base hours per day, 8 in this example and 0 at weekends. In Step 2 we enter the Demand in terms of scope items. In this example, I have entered 9 modules with "expert judgement" estimates (both during Initiation and after Analysis & Design), the order in which the modules should be built, any dependencies / comments. At this stage, nothing is allocated to a resource although if there were heavy skill set constraints you might need to do this. For this exercise, let us assume in the main, any resource could pick up any piece of work. In Step 3 we allocate scope to named resources. In the example, I have started with the initial build order and you can see that in one case, I have split some scope between two resources. This is a good reason why the sheet should be handed to the development team lead as detailed knowledge of the technology will allow decisions to be made as to when work can be split between several people and when this is impractical. When the work is allocated out, the "Allocated" cell is changed from No to Yes so that the Demand isn't included twice in error (Allocated and Unallocated). You should note that you can check the Supply/Demand balance both at an individual level and overall (considering unallocated build scope). Based on this setup (i.e. there is enough work allocated to each resource), this allows build work to commence. It is an individual choice whether you should allocate out all scope or keep some as unallocated. 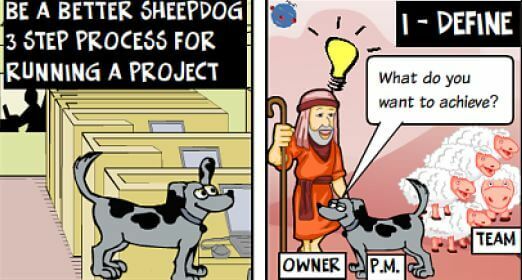 The logic of the latter approach is that things don't always go to plan and so you might need to change allocations during the build phase if everything is fully allocated. In step 4 we look at monitoring of progress against plan. It is now the end of the first week (although you could monitor daily if you want). So build commenced on Monday 6 January 2014 and it is now Friday afternoon 10 January. The Development team leader speaks with their team and the build sheet and establishes the picture. Estimates to Complete (ETC) should be captured from the start of next Monday i.e. ask "EXCLUDING the rest of day, how many hours effort do you need to complete this element of scope?" Richard has completed the build of scope id S05 and believes he will complete the unit testing (S05UT) on Friday afternoon or first thing Monday morning. A cautious estimate of 2 hours for Monday is noted. Armed with this data, the Development team lead can update the build sheet. Firstly, a reduction in SUPPLY needs to be made as one week has elapsed. Next, the DEMAND side can be updated. The date started and date completed can be entered with ETCs updated in line with the meeting held (see above). I would keep the ETC as 0 for completed scope to identify who did the work. Once all the updates have been made then look at the difference between the Supply and Demand both at an individual resource level and also considering unallocated work. With this example, much of the scope has been left unallocated so the sheet shows 7 hours shortfall in resource for the current ETCs. I hope this worked example shows the basics of how to use the Build sheet and the simplicity of the approach. 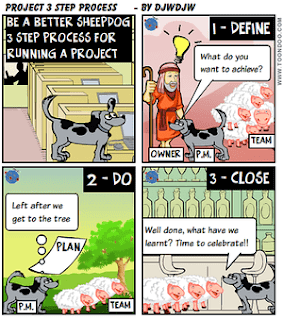 I know from its use within multiple Projects I have run is that Development Team leads can operate it effectively and as a Project Manager it gives me visibility on progress and whether we can still hit the end phase milestone. You should be able to write your own version with some simple spreadsheet skills. If you have an important phase of tasks in your plan consider the use of a formal gated entry meeting to judge whether you can commence. I believe this has great value and in this post I will take you through how I approach with an example. Well in advance, draft, review, agree and document the criteria by which the entry gate meeting will judge whether the project is in a fit state to ENTER. The value in this approach is to be objective in advance of the point in time when the pressure is always to "get on with it". It also acts as a motivator to the criterion owners on what they need to achieve. 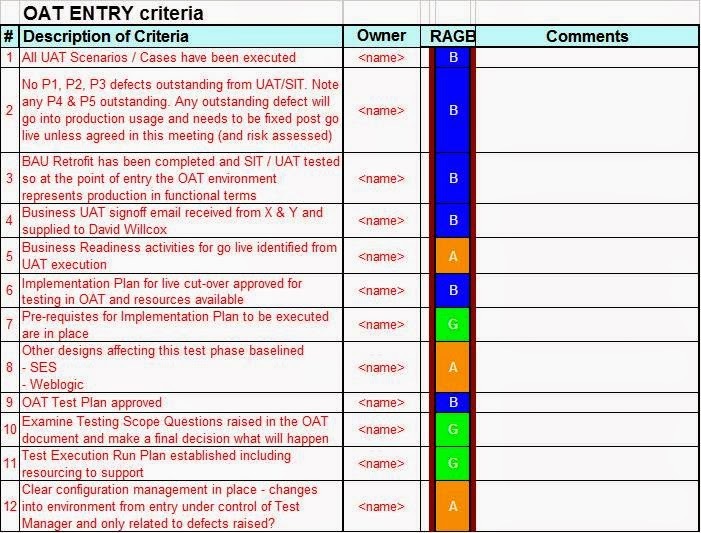 Here is a very recent example I have used in an IT Project for entry into an Operational Acceptance Test (OAT) phase after completion of Systems and Integration Testing (SIT) and User Acceptance Testing (UAT). 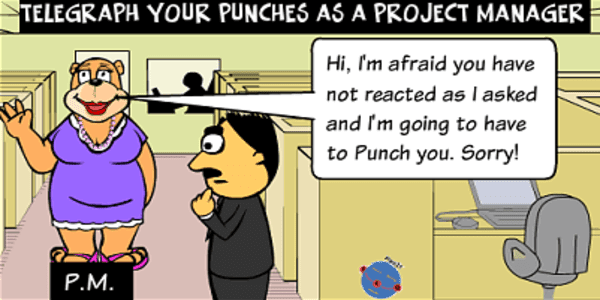 The criteria in themselves are not what I want you to focus in on, I'm sure your project will have different ones. It is the value of the process which I commend to you. The ultimate Entry process is a Project Gate where the whole Project is formally assessed at certain points to see whether it is viable. This can happen in conjunction with the use of PRINCE2 Stages so that as part of the Stage boundary, several aspects of the Project are assessed including a check that the business case is still valid. 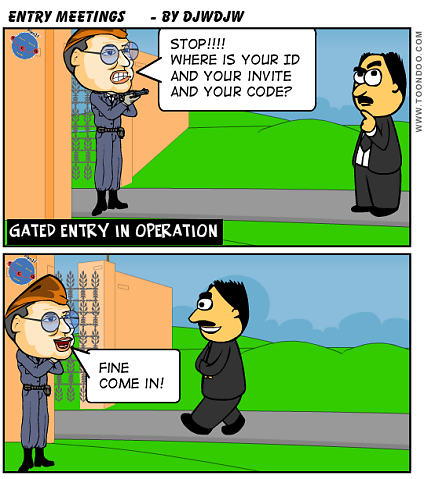 Such Entry Gate reviews can be internally held (e.g. undertaken by the managing Board with potentially some peer reviewers outside the Board) or can be externally managed. A good example of an externally run framework is The OGC Gateway Process which anyone who has worked in major UK government Programmes and Projects is likely to have been exposed to. This is a gated review undertaken by people totally external to the core team / governance. I have spoken about the Entry Gate concept but sometimes it is better to position as an Exit Gate although an exit is typically an entry for the next phase!